When it comes to cop thrillers there are a couple of things that cinema rarely gets right. Firstly, film makers seem largely unable to sustain an effectively taught and surprising plot when combining this genre with comedy. There have been a number of amusing satirical or slapstick police movies but few of them manage to combine this with a compelling original storyline. Consider for example The Heat, The Other Guys, The Naked Gun, Police Academy, Turner & Hooch, Dragnet, 21 Jump Street, Starsky & Hutch and Miss Congeniality. These are all funny films but the narratives that drive them are all painfully cliched. Even Beverley Hills Cop, Hot Fuzz and The Guard, which are probably the very best at bringing the two things together, would not work as well without the laughs. There’s no reason why these genres should not mix more evenly. They can do it with comedy and horror which when you think about it ought to be harder. Scream, American Werewolf in London, Zombieland, Shaun of the Dead, Evil Dead 2, Cabin in the Woods, Gremlins and Ghostbusters are all, at points, as frightening as they are funny. They’ve even managed to juggle humour with gangsters, con men and assassins as with Lock, Stock and Two Smoking Barrels, Ocean’s Eleven, In Bruge, and Grosse Pointe Blank. For some reason though when they involve the police the gags seem to be the important thing with only minimal effort made on the story. The one exception to this I can think of is possibly Kiss Kiss Bang Bang but that’s a Private Detective film really. If there’s an obvious film I’m missing please let me know. Oddly the other category in which I can’t readily name a good police procedural is British cinema. There is absolutely no shortage of great cop TV shows from these isles and a whole list of cool home grown crime flicks from Michael Caine’s The Italian Job to Michael Caine’s Harry Brown but once again when focussing on the long arm of the law greatness seems to be out of our reach. In fact there aren’t actually many UK films about the boys in blue at all, good or bad. (Yes, I know there’s The Boys in Blue but I’ll forget you showed your age and ever mentioned that.) James McAvoy and Mark Strong did do Welcome to the Punch but it’s a weak entry. Blitz with Jason Statham might arguably buck the trend but it isn’t exactly The Long Good Friday is it? 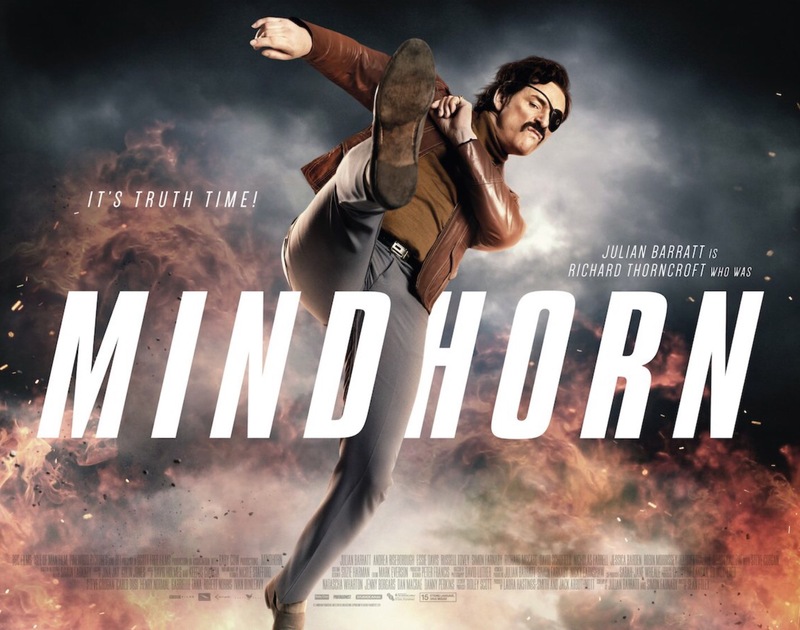 Based on this precedent then, the question is why did I think Mindhorn was going to be any good? It is a spoof film about the star of a 80’s television show set on the Isle of Man. Now, decades later has to get into character again to help the police catch an obsessed fan who has started killing people. It is written by Julian Barrett and Simon Farnaby, two of the creative minds behind The Mighty Boosh and Yonderland respectively. This was no doubt a draw as these are two exceptionally witty and often surreal shows that marvellously demonstrate a particularly British comedy sensibility. They have gone for a straighter style of comedy here though and once again it isn’t really a great success. The humour is not at all sophisticated and while it does raise some laughs you can see the jokes coming a long way off. It explicitly satirises The Six Million Dollar Man and Bergerac which were actually too different for this to really work well and it doesn’t really have anything new to say about either of them. The film takes aim at the notion of fading celebrity as well but similarly fails to add anything surprising to this idea. As for the plot it is even worse than with other films of its type. The story revolves around small town conspiracy and cover up but the criminal’s motivations are all of the most predictable nature and the reasons for betrayal lazily written. The final act has no tension whatsoever despite there being some gun play and character’s attitudes towards one another switch for reasons of utter convenience. It is possible this is part of the joke but if I don’t know that for sure then it evidently didn’t work as it should have. The characterisation of the lead, played by Barrett, is also pretty broad. This would have worked in The Mighty Boosh were every aspect was much much larger than life but here it just come across as odd. Andrea Riseborough and Kenneth Branagh both feature in roles that are way beneath them and Steve Coogan is obviously here as a favour. Only Russell Tovey does anything interesting with his screen time playing his part surprisingly convincingly given the rest of the film. Really, when you think about all of this you realise what an exceptional film Carry on Constable really was.